Did anyone go to Hove as Witnesses? I just feel sad for passengers at Brighton who've chosen that train as the only direct one of the day to Gloucester, Cheltenham and Worcester to learn it's not running from there. Mind you ... if the 08:59 is not running, passengers for Cheltenham Spa can take the 09:05 and change at Barnham, Fareham and Bristol Temple Meads and get to Cheltenham earlier, and can connect at Cheltenham Spa into the train that should have started from Brighton and didn't. 17:02 Brighton to Bristol Temple Meads due 20:26 will be started from Worthing. It will no longer call at Brighton, Hove and Shoreham-By-Sea. 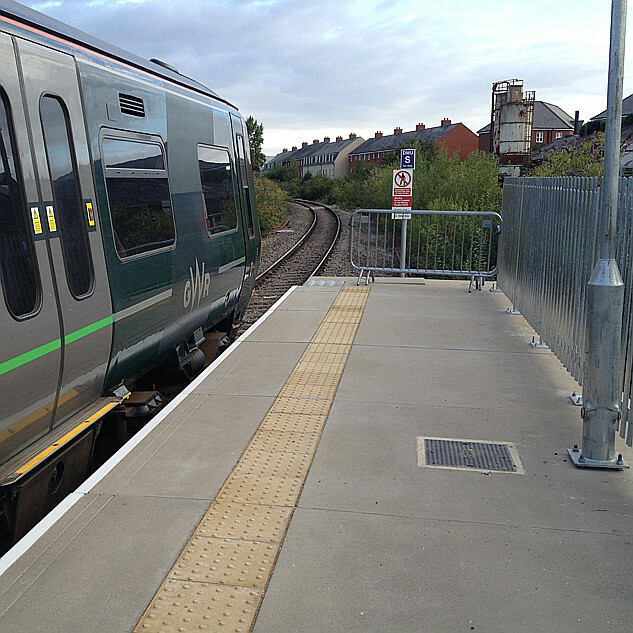 This is due to a fault with barriers at a level crossing. 17:02 Brighton to Bristol Temple Meads due 20:26 will be started from Worthing and terminated at Westbury. It will no longer call at Brighton, Hove, Shoreham-By-Sea, Trowbridge, Bradford-On-Avon, Bath Spa, Oldfield Park, Keynsham and Bristol Temple Meads. 15:50 London Paddington to Moreton-in-Marsh due 17:26 will be cancelled. 10:48 Great Malvern to Brighton due 16:14 will be terminated at Worthing. It will no longer call at Shoreham-By-Sea, Hove and Brighton. 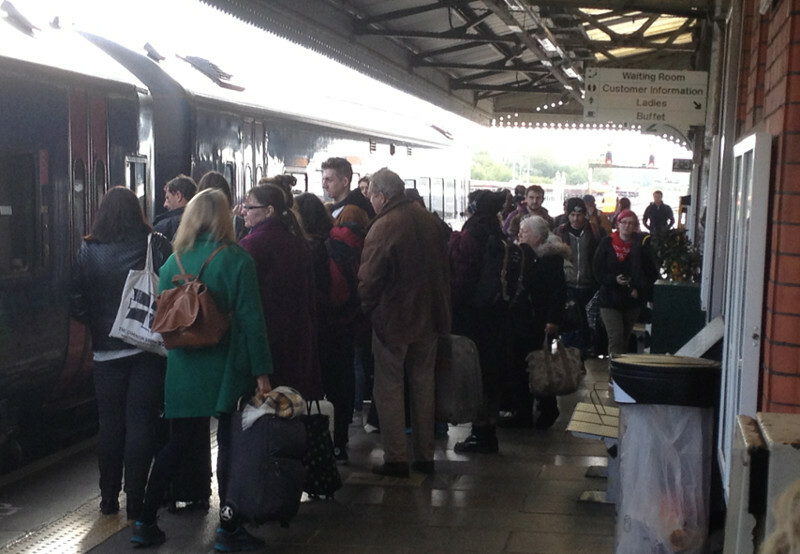 It has been delayed at Bristol Temple Meads and is now 23 minutes late. This is due to trespassers on the railway earlier today. Happens on the buses too ... Axminster to Beer about 10 days ago turned out to be advertised as a through route but with a change in Seaton! 12:39 Bristol Temple Meads to Brighton due 16:14 was terminated at Westbury. It will no longer call at Dilton Marsh, Warminster, Salisbury, Romsey, Southampton Central, Fareham, Cosham, Havant, Chichester, Barnham, Worthing, Shoreham-By-Sea, Hove and Brighton. 17:02 Brighton to Bristol Temple Meads due 20:26 will be started from Southampton Central. It will no longer call at Brighton, Hove, Shoreham-By-Sea, Worthing, Barnham, Chichester, Havant, Cosham and Fareham. Especially "classic". That's the 18:42 from Southampton calling at Romsey and Salisbury at 19:13. It has been delayed at Westbury and is now 40 minutes late. 10:48 Great Malvern to Brighton due 16:14 will be terminated at Southampton Central. Goodness .. first report for a week. 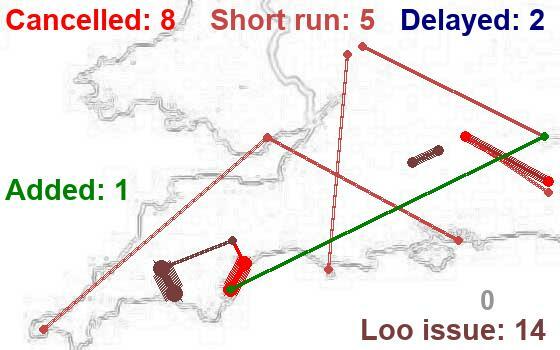 Do 2 coaches cause less congestion than 3 as they get through junctions quicker?? 07:09 Portsmouth Harbour to Brighton due 08:35 will no longer call at Emsworth, Southbourne, Angmering and Portslade.